In line with the overall schedule, the second-screen applications developed by IRT are ready for the validation phase of the VisualMedia project. During this phase, two applications representing different use-cases will be deployed: the first application is focused on the use-case proposed by RTVE and provides an image gallery complementing a selection of images shown on live TV. 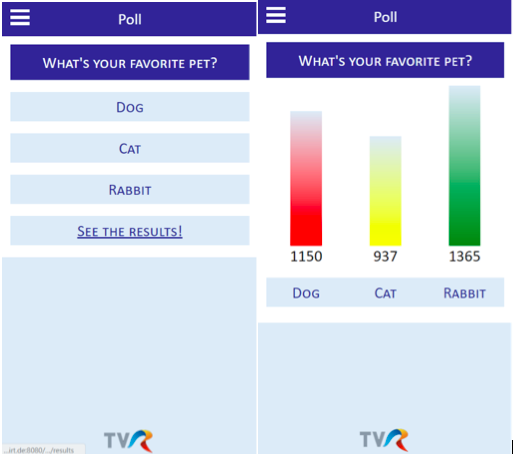 The second application addresses the use-case provided by TVR, an application to vote interactively on different options in the context of a TV show. Both applications follow the responsive design paradigm and were tested on smartphones, tablets, and desktops. Since they are using current web technologies, they can be run on any device and operating system. The selection of the content to be displayed or the polls to be offered is done in the social media engine. Similarly, the processing of the data received from the applications is also done in the social media engine. The connection between the applications and the social media engine is provided by the online distribution engine that acts as a message broker and provides the backend functionality for the second-screen application. After launching the RTVE application, a scrollable list of images with a brief description is shown. The end-user can select a specific image that is then shown in larger version. For the second use case proposed by TVR, the users are presented with a selection of different options defined in the social media engine. The users then select one of the options and the selection is forwarded as input to the social media engine where the votes are tallied. After all votes have been collected, the social media engine operator can also initiate the display of the final results in the application. During the validation phase of the project, the applications will be refined and in particular the end-users’ feedback will be taken into account during the fine-tuning of applications.